“The carpet is really ugly”, Mel concedes. Nonetheless, the company’s co-founder feels very comfortable at her workplace. Osmotic Studios – a space with a sofa, four work areas and three people. The faceless office with its suspended ceiling and wear-resistant flooring is more exclusive than it looks, since Osmotic shares the address in the Hamburg residential quarter Eilbek with other small studios. 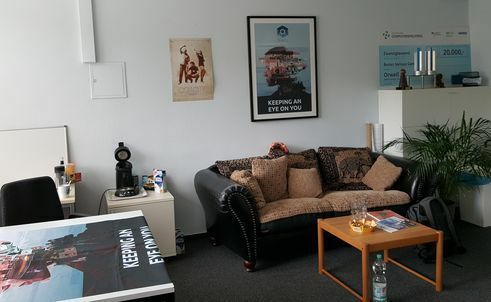 This is where some of the best German games of recent years have emerged, where multiple winners of the German Computer Game award sit close together, share feedback and experiences. For Mel Taylor, networking is part of the job. The Osmotic co-founder is not only in charge of artistic design for the games, she also runs the business end, gives lectures and interviews. Osmotic Studios| Hamburg | Photo: Jan Bojaryn She’s had a lot to do in recent months. Together with game designer Daniel Marx and programmer Michael Kluge, she brought the surveillance thriller Orwell onto the market in October 2016. Here, gamers become cogs in the government’s surveillance apparatus. They have to analyse increasingly personal data of suspect target persons. But there’s a good reason for this. A terrorist attack is the motive for the investigations, the danger is real. Gamers have to weigh when and how deeply they should intrude into the lives of others. And they have to draw the right conclusions from the entire chaos of information in social networks, magazines and interview transcripts. The concept is not only unconventional, it is also well-implemented. In Germany the title won the German Computer Game Award in the “Serious Game” category. What’s deserving of note, though, is just how well the game has been received internationally, although it seems dry and unapproachable at first glance. If you want to understand its pull, you’ll just have to give it a try. If it gets to me emotionally. I recently played Night in the Woods. It’s about a girl who has just broken off her studies and returns to her home town. But conditions in the city are hopeless and young people have no opportunities. What’s special about this game are her deep dialogues with her old friends. That is really gripping even if the gameplay isn’t all that much of a challenge. I admire Playdead from Denmark, who’ve created Limbo and Inside. Both games are very gloomy, but very atmospheric too. I’d like to do something along those lines. With Orwell one learns how to spy on other people. Is that fun? The weird part is that most people don’t find spying on others at all unpleasant. They’re curious instead. And if it doesn’t feel unpleasant at all, one might give some more thought to why this is so. And how one handles one’s own data online. With the name Orwell you allude George Orwell’s novel 1984. There surveillance is a tool of evil. In your case not necessarily. Is that intentional? Yes. Of course, the title Orwell has a negative background. We wanted to evoke the association with 1984, but we didn’t want to moralise and act as if we already have this dystopian surveillance state. The world is more complicated than that and we want to show that. On the one hand, intruding on other people’s privacy is problematic. But on the other hand there’s a reason why the government needs to investigate. I’d say so, yes. But we have to have violent and uncritical games as well. But the more games there are of this kind, the more they are internalised, not just by teenagers, but by adults as well, and I do think we have a responsibility to present more complex things, other things. I want to contribute to more variety in the game industry.